Where will they sleep? If we don’t come with something soon, someone will inevitably have to spend the night tossing and turning on the couch! That’s why the best air mattress can be a homeowner’s best friend! So, let’s find you one today! Before you spend your money on an inflatable bed, you’ll probably have your doubts. Do I need an air mattress? Are there any benefits to owning one? That is, by far, the most significant benefit of owning an air mattress – you don’t have to worry about sleeping arrangements ever again! With an air mattress, you get to take your bed with you wherever you go. That way, it doesn’t matter if you have some unexpected guests and no guest room to offer them, in the middle of the woods, or on a road trip with your friends – inflate your mattress, and you’re bedtime-ready! I’ll talk in detail about all the possible uses you can get out of an air mattress, so keep on reading! A regular mattress doesn’t give you a lot of room for adjustments – it is what it is. However, due to their nature, air mattresses give you the option of choosing the desired level of firmness whenever the need arises, and yes, that means you can do it without getting out of bed, too. For instance, if you’d like your bed to be a bit softer, all you need to do is let some of the air out until you get the desired results. Alternatively, you can inflate the mattress to its full capacity for extra firmness. No other type of mattress on the market gives you these options! Okay, let’s say you have some relatives coming to visit, and no matter how many sleeping arrangements you come up with, you always end up with one bed short of what you need. What do you do? Buy an extra bed? Of course, not – air mattresses could be your budget-friendly solution to an otherwise costly problem! Before we move on to the air mattress reviews, would you like to see how some of the most popular models on the market in 2019 compared to each other? Here’s a quick side-by-side comparison, using five essential criteria! Okay, it’s time for the actual, in-depth reviews. Below, you’ll find everything you need to know to make an informed purchase decision, so read carefully! Let’s start the list with an air mattress that will help you stay sound asleep (pun intended) throughout the night, without even feeling like you’re sleeping on an inflatable bed – the SoundAsleep Dream Series air mattress. First off, the mattress is raised, with the “double-height“ of 19 inches, so your guests won’t feel like they’re sleeping on the floor. And thanks to the 40 internal air coils, the ComfortCoil Technology provides plenty of firmness and support. Moreover, the mattress won’t slide around on the floor – as many inflatable mattresses tend to do – thanks to the Sure-Grip bottom design. The pump itself is an internal one, meaning you won’t have that much of a hassle setting the bed up for some surprise visitors. Plus, it reaches full inflation in under four minutes! However, I did notice the power cord is a bit short, which leaves you with two options – either you have to place the mattress next to the power outlet, or you can inflate it, and then carry it through your home to where your guests will sleep. Also, be sure to warn anyone who’s about to sleep on it about the lack of support around the edges! 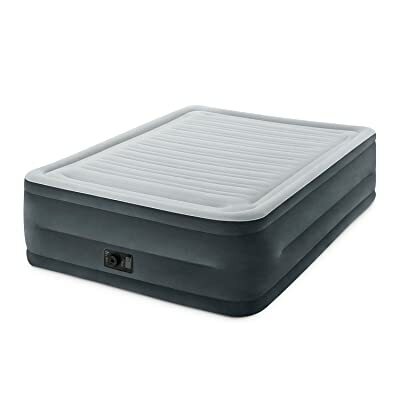 The SoundAsleep Dream Series Air Mattress is one of my personal favorites. It’s the only one I found that features 40 internal air coils, so of course, I wanted to try it out, and see how it felt. And let me tell you something – it felt amazing. With the best mattress topper on top, you could almost fool someone into thinking it’s a regular mattress and not an inflatable one. Sure, it has its issues, but all in all, pros greatly outweigh the cons. 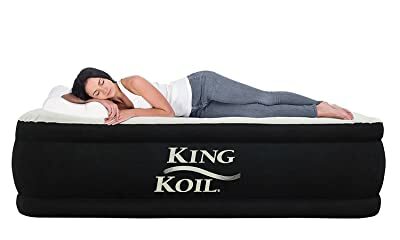 If you’re looking for an air mattress that’s still capable of providing the spinal support and firmness of a regular one, this King Koil model should be at the top of your list of considerations. 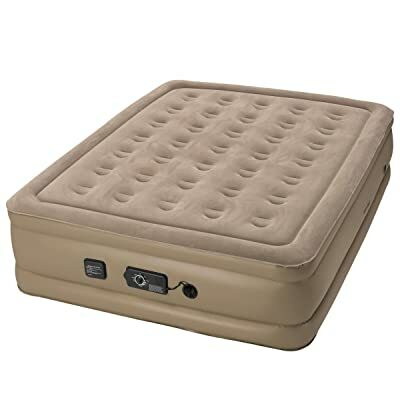 Having 20 inches in height, and a suede, waterproof top, which also helps keep your bedding in place, this one could easily be crowned king of air mattresses. Again, pun intended. The internal 120V AC pump is the primary source of power for inflation, and it does inflate fully in under four minutes, which is always a plus. 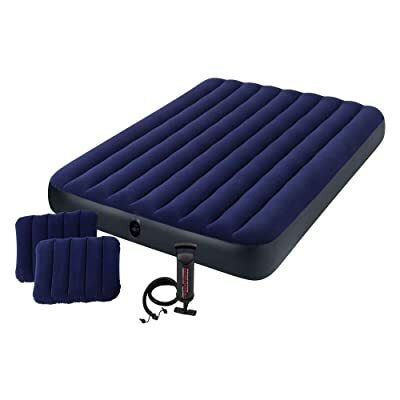 But here’s where things go from good to better – it also features an additional external valve, so you can bring your air mattress with you on camping trips, and not worry about having access to electricity. Sadly, it did have the initial rubbery smell, though – I was hoping I could avoid that problem with air mattresses. Leave it to air out for a few hours, and I’m sure it’ll get better, though. What bothered me was all the noise. It’s squeaking when you move, and it’s cracking when you get up (while it’s getting back to its shape). I like to call this one the king among air mattresses, and yes, partly it’s due to its name, but more importantly, it’s because how great sleeping on it felt – time after time. I was surprised to learn an air mattress could provide this level of spinal support and firmness. So, if you have a bad back, and you can’t avoid sleeping on an inflatable bed, this one should be your top choice! The next one on my list is an Intex Dura-Beam airbed – a reasonably affordable, queen-size air mattress ideal for home use. Thanks to the horizontal air chambers, the mattress feels pretty supportive and stable, which makes for a very comfortable sleeping experience. The bed itself is 22 inches high, too, which is pretty impressive for an air mattress, don’t you think? Furthermore, thousands of polyester fibers, also known as the Fiber-Tech construction, are combined with the plush flocking, add a touch of softness to the mattress. Plus, it’s waterproof! Inflation and deflation won’t be an issue, either, since the mattress comes with a high-powered, built-in electric pump. You can expect your “temporary bed“ to be ready to use in four and a half minutes or so. One thing I didn’t like is the fact that the mattress doesn’t feel as sturdy around the edges, as it does in the middle, so there might be some risk of you rolling off the bed if you’re not careful. Also, you’re going to have some trouble finding the sheets that fit, because, for some reason, queen-size bedding doesn’t work with this mattress. I just thought I should let you know up front. Okay, I’ll be honest with you – this model deserved its place in my round-up because of its height – 22 inches is enough to give anyone a feeling of sleeping on a proper bed, and not an inflatable one. I mean, think about it – even getting in and out of bed is going to be a lot more comfortable when the bed is appropriately raised. Okay, let’s talk about the heavy-weight champion! Why did I call this mattress that, you ask? Well, it’s because of the slight (but essential) advantage it has over other models regarding weight capacity. While most queen-size air mattresses have a capacity of 600 pounds, the Etekcity model can handle up to 650 pounds. It’s not a huge difference, but it’s there! The mattress itself is 22 inches high, so it doesn’t feel like sleeping on a „back-up“ bed, at all. I also know you’ll appreciate the skid-free base, which will help keep the mattress in place through all the movements you make in your sleep. It’s nice to know you won’t have to chase the bed around the room, right? Again, there was a distinct rubbery smell when I first opened the package, so I suggest you leave yours out to “breathe”, too. The more significant issue was the fact that it didn’t hold air very well. At first, I thought I might be going crazy, but as it turns out, there was a subtle hissing sound coming from where the pump is. The mattress will work, but you’ll have to top it up every two nights or so. In case you were wondering, I gave this one a nickname, too – the heavy-weight champion. Besides having a raised design, with 22 inches in height, this inflatable bed also has an outstanding weight capacity of 650 pounds. So, if you need a mattress that could handle two not-so-slim adults sleeping on it for a couple of nights, this is, by far, your best bet. 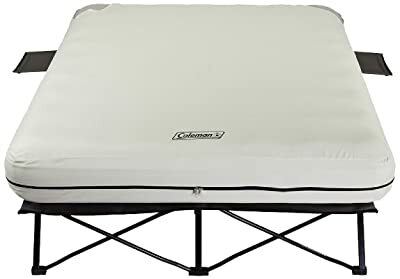 Now, here’s a little something for all the nature lovers and camping enthusiasts reading this – an air mattress by Coleman! Besides the mattress itself, you also get a cot, which gives it the „proper bed“ feel, since the mattress stays off the ground entirely. Furthermore, with the ComfortStrong coil construction, you get plenty of support, while the AirTight system helps keep air leakage under control. It’s perfectly capable of holding up to 600 pounds of weight, and I know folks that are over six feet tall will appreciate the length, too. It’s not only an excellent outdoor bed but one you could use in your home, as well. And while I do find this to be an excellent choice for camping enthusiasts, I do think it might be too heavy for backpackers in particular. One major downside is the 4D battery-operated pump – it seems like it struggles a lot to inflate the mattress all the way. Everything runs smoothly up to a certain point when the pressure inside starts pushing the air out, and the pump can’t seem to catch up. More often than not, a manual pump will be needed to finish the job. If you’re big on camping, then you’ve undoubtedly heard of Coleman before. Chances are you already own at least one piece of equipment for your outdoor adventures from their wide range of products. So, of course, I had to include their air mattress on this list, too. The sturdy, metal cot is a bonus – the extra elevation will make a huge difference in your overall camping experience. No more sleeping on the ground for you! So far, you’ve seen some expensive models and some that could be considered affordable. Now it’s time to focus on a budget-friendly model by Intex. It falls short regarding height – it’s less than 9 inches high when inflated – but you can’t complain given the price, can you? Even with that less-than-ideal height, it still manages to stay comfortable and can handle up to 600 pounds of weight. Plus, it comes with two inflatable pillows, too! The surface feels soft to the touch, and not “cheap” at all, which was a pleasant surprise. Furthermore, it’s waterproof and easy to clean, so you don’t have to worry about getting it dirty. However, beware that the mattress uses a manual pump, so you’ll be doing all the work. Now, you always have the option of buying an electric one, but that kind of defeats the purpose of purchasing an affordable airbed in the first place, don’t you think? Also, please note that the firmness of the mattress changes depending on the environmental conditions, so be ready to top it up if the need arises. Overall, it’s a great mattress – as long as you don’t mind all the squeaking, that is. If you’re not willing to spend big bucks on an air mattress when you only plan on using a couple of times a year, this one might be the perfect solution for you. Sure, with the height of fewer than 9 inches, it sits pretty low, but if you’re going to use it for a night or two only, I’m sure you won’t mind. The two inflatable pillows are a bonus! And now, a little something for the youngsters – the Shrunks inflatable mattress for toddlers. So, if you have a child older than 24 months, and you need a reliable air mattress you can use while traveling or one you can pull out when it’s time for sleepovers, look no further! Since it’s a bed for kids, the first thing you should know is that it’s made from lead, phthalate, and BPA-free PVC, so it’s entirely safe for your little one. And since we’re on the subject of safety, the mattress features guard rails – raised sides that should help keep your child feeling cozy and secure. Now, keep in mind kids can be the most restless sleepers of all, so don’t be surprised if your child somehow finds its way to the floor. The guard rails are good, but they’re not that good, you know? Oh, and moms, you shouldn’t worry about the sheets sliding off, either. Thanks to the sheet-tuck feature, the bedding will stay tucked away around the inner mattress throughout the night. It has a bit of a plastic smell, though, but as long as you air it out, it will be fine. It’s, by far, the best air mattress for toddlers. Everything about it is focused on keeping the little ones safe – from the phthalate, lead, and BPA-free materials, to the guard rails that should help your child from ending up on the floor. 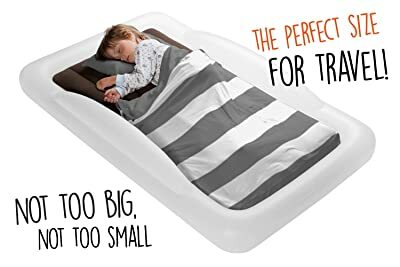 So, if your little one has a birthday coming up, and there’s mention of a sleepover, too, you should consider buying this Shrunks inflatable mattress. Given the fact that it can be inflated entirely in under four minutes, this air mattress is genuinely deserving of the name Insta-Bed. Featuring 35 coils, and an adjustable firmness level (you get to choose from plush, medium, or firm), this mattress provides one of the most supportive sleeping experiences out there. What makes it stand out of the bunch is the dual pump system. So, first off, there’s the primary pump, capable of quickly inflating and deflating the mattress. Once it’s full, it shuts off automatically, so you don’t have to worry about that, either. Then, there’s the secondary one – the so-called Never Flat pump – that doesn’t go off until the pressure in the mattress starts dropping. Once there’s a change in pressure, it will turn on automatically, and take care of things in a quiet manner. One thing I noticed (besides the smell the material gave off during the first few days) was that the surface is a bit too bumpy, almost to the point of becoming slightly uncomfortable. Now, don’t get me wrong, I still recommend this air mattress, and I didn’t mind it that much, but it’s something you should keep in mind, nonetheless. Guess what the main reason why I decided to include the Insta-Bed air mattress in my round-up is? That’s right, the dual pump system! The primary pump is a standard (except having an automatic shut-off feature), but the second one is what makes it outstanding! Having a pump that there to make sure there’s no change in your bed’s firmness while you get a good night’s rest sounds fantastic, right? 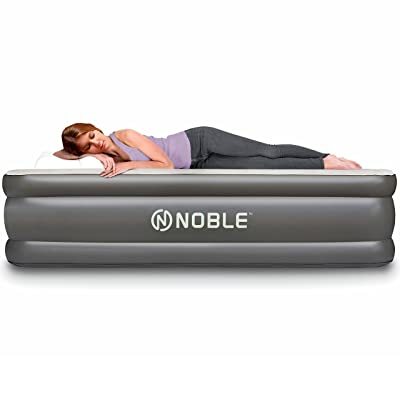 Next on my list is a model by Noble – an air mattress with a raised “double high” design. Thanks to the 18 inches in height, it does help with the whole sleeping-on-the-floor thing. Plus, the raised design makes it an excellent choice for both sleeping indoors, and outdoors. The mattress utilizes a standard built-in 120V AC pump, which pretty much ensures a hassle-free set-up – it will be inflated and ready to use in under three minutes. It’s easily one of the shortest set-up times on the list, at least for air mattresses of this size. Also, don’t worry about the sheets sliding all over the place – the suede top will take care of that for you. Furthermore, it’s waterproof and quite durable, so I’m pretty confident it could withstand some heavy use. However, I did notice the mattress might have some serious issues with air retention – or lack of it, thereof. As soon as you inflate it and lay down, you’re likely to hear that dreaded hissing sound, which can only mean one thing – the mattress isn’t holding air very well. Maybe I just received a faulty item, though – who knows? If the quick set-up is what you’re after, the Noble air mattress should be one of your top choices – the powerful, built-in pump is capable of inflating the entire mattress in just under three minutes. Get the bedding ready, turn on the pump, and voila – you have a bed ready! Sadly, it had a problem with air leakage, which almost made me reconsider including it on my list of the best air mattresses. Okay, one more, and that’s it, I promise. The last candidate for the title of the best air mattress is another Dura-Beam model by Intex – and an affordable one, for that matter. Let’s talk comfort first. The mattress features Fiber-Tech construction – thousands of polyester fibers – which not only make it more comfortable but provide additional stability and support, as well. Add the soft top, and you’re already in for a comfy sleeping experience. And speaking of comfort, the mattress features one raised edge, which pretty much serves a built-in pillow. So, if you don’t feel like bringing your pillows with you on a camping trip, or you’re merely out of spare ones, this handy feature could help you out tremendously. Sadly, it doesn’t hold air very well. Of course, that’s not such a huge issue, as long as you have a power outlet close by – a refill now and then is all it takes. Another, more significant issue, is the overall durability of the mattress. I’m not convinced it would be able to withstand any prolonged (medium-to-heavy) use, such as long backpacking trips. I might be wrong, but that’s just the overall impression I have. No, I didn’t save the best for last this time. While this Intex mattress is an excellent option for anyone looking for a comfortable, yet affordable sleeping solution, it’s nowhere near as durable as some other models on the list. Of course, if you don’t plan on sleeping on it for a prolonged period, you could make it work – maybe it’s not intended for heavy use, but it’s a good temporary solution, nonetheless. Now that you’ve seen what the market has to offer, it’s time to learn how to make the right choice, and buy the best air mattress for your needs. The first thing you should consider before you buy an inflatable mattress is how – and when – you plan on using it. I touched upon this when I was talking about some key benefits of owning an air mattress, but it’s time to get into the details of it all. Spending a night on a couch can be a less-than-ideal experience. So, why would you want to put your guests through something like that, when you have the option of buying an air mattress for a somewhat affordable price and give them a proper, comfortable place to sleep? Be one of the hosts known for their hospitality, not their lumpy couch! If you ever had to spend the night in your car, you know how uncomfortable it can be. Luckily for you, though, no matter what car you own, there’s an air mattress that will fit right in, so you can catch some much-needed zzz’s while you’re on the road. All you need to do is pay attention to the dimensions of the mattress. Let others opt for sleeping bags, while you enjoy the comfort of your inflatable bed. Yes, it will take a bit more time than just laying your sleeping bag flat on the tent’s floor, but it’s well worth it, trust me. Plus, you don’t have to worry about all the creepy crawlies that might wander inside your sleeping bag anymore. As it turns out, size does matter – especially when you’re picking the best air mattress. The good news is that most models come in a variety of sizes, just like regular mattresses do, so all you need to do is establish how many people will be using it (and where), and pick accordingly. Most commonly, you’ll find them in sizes Twin (38 x 74) and Queen (60 x 80), but Single (36 x 74), and Double (54 x 74) are available, too. It all depends on the manufacturer. Be careful, though – in most cases, the size of the mattress determines its capacity, too. The math is pretty simple – the thicker the mattress, the more comfortable the sleeping experience. And trust me, you want it to be as comfortable as possible when it’s time to hit the sack. Otherwise, there won’t be that much of a difference if you were spending the night on the floor. If you want a more “traditional“ sleeping experience, a raised air mattress is the way to go. Height-wise, they resemble a typical bed, providing comfort, and keeping you as far away from the cold floor as possible. Plus, it’s always a better long-term solution – it’s easier to get up, and it feels a bit more like a real mattress! Since they lack the added base, low profile mattresses are usually cheaper and way more compact than their raised counterparts, which makes them the perfect choice for camping trips and other outdoor activities. The whole thing seems simple enough – you inflate it, and you’re done. Well, you might want to reconsider that. Unpacking and unrolling the mattress can be a pretty tiring experience – and then there’s the whole waiting game. On that note, make sure to check what type of pump the mattress uses, too. As you saw previously, some models come with built-in pumps (which are super convenient), while others require you to get a separate pump, and handle things the old-fashioned way – manually. These pumps are usually found on the cheaper models, and can be battery-powered, plugged in via a power cord, or even manual. The good news is that, since they’re not attached to the mattress itself, you can use them around the house for other stuff, too. The bad news is that they’re much easier to lose. If you want a pump that does it all, internal is the way to go. Most of them operate automatically, which means you don’t have to wait around to turn it off once the mattress is fully inflated. Plus, most of them come with the deflate setting, as well. What good is an air mattress that doesn’t hold air? It’s perfectly normal – common, even – for airbeds to deflate to a certain extent during the night. Your body weight, temperature, and even humidity play a huge role in that. However, a noticeable loss of pressure is not something you should deal with every night. Plus, it could turn out to be super uncomfortable. If this is something you’re worried about, I suggest you go with a model that allows you to top it up whenever the need arises. Well, “pets“ is too broad of a term – a hamster wouldn’t be able to do much to your air mattress. Cats are an entirely different story, though. Their sharp, little claws can – and will – go through your airbed like a hot knife through butter. Does that mean pet owners can’t use air mattresses? Of course, not! You’ll have to be a bit pickier when you start looking through the best air mattresses. Oh, and trimming your kittie’s claws wouldn’t hurt, either. The price can depend on a lot of stuff – the size, the pump, and even the brand name can all determine how much you’ll have to spend on an air mattress. Don’t assume price equals quality, though. 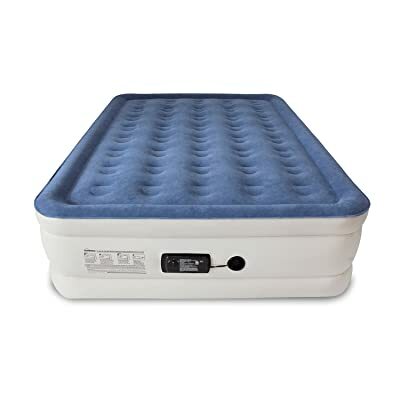 Furthermore, take a moment to consider how often you plan on using your air mattress – if it’s going to spend most of its „life“ in a storage box, there’s no point in paying big bucks on one. But if it’s going to be a permanent sleeping solution, spending more makes sense, right? Now that you have an idea on what to look for in the best air mattresses, we should take the time to discuss how you’re going to pick the best one for your needs. What do you need the mattress for? If you’re going to be using an air mattress as your permanent bed, at least do it with style. Nowadays, sleeping on an airbed doesn’t necessarily mean just dropping a mattress on the floor and calling it a bed – there are models available on the market that come equipped with sturdy, metal frames. The Coleman Airbed Cot is an excellent example of that. Another thing you should pay attention to is the quality of the pump. When it comes to everyday use, I strongly recommend going with an internal pump and easily adjustable firmness levels. The Insta-Bed Raised Air Mattress might work great as a temporary (or even permanent) bed. You get all the comfort – minus the hassle. Turning away guests would be rude enough, but letting them sleep on your lumpy couch would be even ruder. If you find yourself in this position more often than you’d like, you should consider getting a raised (or platformed) air mattress. Thanks to their raised profile, they sit higher off the ground, which almost feels like sleeping on a “real“ bed. Also, did you know convertible air beds are a thing, too? Having the option to combine two beds into a large one gives you more versatility compared to merely buying two separate twin-size beds. So, if your house is always full of friends and family, you should probably look into getting a convertible. Not the car, the mattress! Lastly, if you have grander plans for your air mattress than keeping it locked up in your home, there are two things you need to keep in mind – weight, and ease of use. As you can imagine, a 40-pound inflatable bed isn’t the best choice of equipment for any outdoor activity, let alone backpacking. Play it safe, and keep things lightweight – low-profile air mattresses are your best bet here. Okay, let’s say you picked out the best air mattress for your needs, ordered it online, and it finally arrived. What now? How do you turn this pile of rolled up plastic into a proper bed? 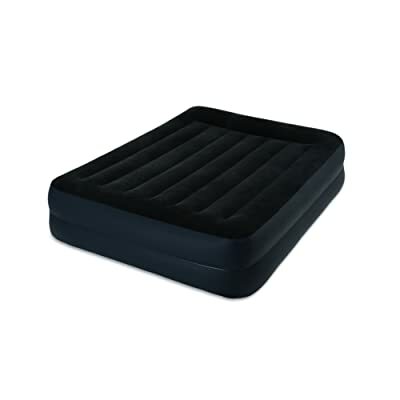 First, you should find a suitable location for your air mattress. Trust me, you don’t want to inflate it first, and then have to carry a full-blown mattress around. Make sure you have enough space for it to expand, too. Before you unroll your soon-to-be air bed, take note of how it was folded – it will make rolling it back up a lot easier. Lay it on the flat surface before you start inflating, and check for any sharp objects lurking around while you’re at it, too. Now, all you need to do is inflate the mattress – remove the valve cap, insert the pump, and let it fill with air until it reaches the desired capacity. Oh, and don’t forget to check if the valve is closed once you’re done! Now, all you need to do is add some sheets, pillows, and blankets, and you’re good to go! When you think of durable mattresses, chances are you’re not thinking about the inflatable ones. How durable can they be, right? Don’t over-inflate the mattress the first time you use it, and opt for a more gradual approach, instead. Inflate it, leave it be for a couple of hours, deflate it, and repeat the process. Rinse and repeat, as they say. Give the material a chance to get used to being stretched before you throw your body weight into the equation. Every air mattress has a weight capacity, and it’s there for a reason. Don’t even think of going over the limit stated in the product description – all you’ll do is rupture the mattress, and end up sleeping on the floor. Knives, scissors, freshly sharpened pencils, sewing needles – all of that has to go if you plan on keeping your air mattress alive and well for a long time. If you’re not careful, you could end up with a hole so tiny that it’s impossible to locate. Okay, as an adult, you’re probably past the point of jumping up and down on your bed, but your kids are probably not. Remind them you’re dealing with an inflatable mattress, and that jumping on it is overall a pretty bad idea. An over-inflated mattress is more prone to leaks and tears. It’s as simple as that. Once you pinpoint the problem, you should deflate the mattress entirely before you attempt fixing it. Okay, now’s the time to bring out the repair kit that came with your air mattress. Apply the sealant, and wait for approximately five minutes – it will need time to set. Repeat the previous step twice – a total of three layers should be enough to keep everything together. If you want to make sure it will hold, you can always apply the repair patch, too. You know, just in case! I have to admit, that’s a hard question to answer. There are so many different models to choose from, plus it mostly depends on your personal needs. But, since you’re here for an answer, I’d say that, for everyday use, the Insta-Bed Raised Air Mattress seems to be the best option, just because you won’t have to worry about air leakage – the pumps take care of everything. Are air beds bad for your back? Well, it depends – how often do you plan on sleeping on your air mattress? As a temporary solution, the chances of developing a bad back are relatively slim. However, if an air mattress is your long-term solution, know that it won’t support your body – and most importantly, your spine – which could result in back pain and stiffness. Are there comfortable air mattresses? Have you been paying attention? Of course, there are – you have to weed out the low-quality, uncomfortable ones, first. You have ten amazing models listed above, after all! Is it bad to sleep on an air mattress? Air mattress is a handy backup plan for surprise visits from family and friends, and a great way to make a camping trip more comfortable – and if that’s how you plan on using your air mattress, no problem. But if we’re talking about the prolonged use of an inflatable bed, then yes, it’s bad – there’s no proper support, or temperature regulation, and some models aren’t that comfortable, either. Can I use an air mattress as a primary bed? Regardless of what the manufacturers promise you in their advertising, no air mattress is suitable to be used as a permanent sleeping solution. No matter how high-quality they are, they can never be as durable as a regular mattress. When it comes to air mattresses, it’s best to stick with the sporadic use or to use them as temporary beds. Why won’t my air mattress stay inflated? Some air leakage – although minimal – is quite common in air mattresses. However, if it gets to a point where your mattress deflates significantly during the night, it might be time to take a closer look at your bed. Is the cap on the air valve fastened correctly? Check these things – chances are the reason for deflation is hiding in there somewhere. How can I fix a leak in an air mattress? Don’t panic; air mattresses do tend to leak from time to time. Plus, it’s relatively easy to fix. First, follow the hissing sound – you have to know where the leak is if you want to repair it, right? Once you find it, use a patch from the repair kit to close up the hole. If you can’t find one, know that duct tape is a valid (but temporary) solution, too. Do I have to fill up my air mattress every once in a while? Generally, air mattresses don’t need to be “topped-up” after the initial inflating. However, if you slept on your air mattress for more than two consecutive nights, and it feels like it lost some of its firmness, you can use the provided bed pump to restore it to its original condition. Don’t overdo it, though. How do I deflate my air mattress? There are two ways you can go about this – either you use the pump (some have the deflate settings, others don’t, so make sure you check that, first), or you do it manually. Remove the cap from the air valve, wait to hear the air “escaping,” and then walk up and down the mattress a few times (I suggest you remove your shoes for this). Next, roll it, starting at the end opposite to the valve – it helps speed up the deflating process. What’s the maximum weight capacity for air mattresses? Twin size air mattresses can handle around 300 pounds, while queen-size ones can handle two times more (600 pounds, in case you’re bad at math). A full-size air mattress can support two people, as long as they don’t weigh more than 450 pounds. Do air mattresses require any special maintenance? That’s the best thing of all – air mattress require little to no maintenance! In most cases, all you have to do is deflate it, roll it up, and place it in a box. If it does get dirty, though, just run it through some soapy water, leave it out to dry, and repeat the steps mentioned above – that’s it! Final Verdict: What’s The Best Air Mattress On The Market? Congratulations, you arrived at the end of the article! As a token of gratitude for your patient reading, I’ve decided to help you make your choice by singling out the best one out of the bunch – the SoundAsleep Dream Series Air Mattress. As always, I’d like to hear your thoughts on the matter. Did you find your perfect inflatable bed on this list? Let me know in the comments below!